MIT researchers have designed an efficient, potentially low-cost system that will use the sun’s energy to produce electricity and hot water or steam simultaneously. Their design is based on a conventional solar thermal system but incorporates special features that make it more efficient and flexible. For example, it uses evaporation, condensation, and gravity to move the captured heat to the point of consumption—no need for an energy-consuming pump. It generates electricity using a solid-state technology that converts the captured solar energy directly to electricity with no moving parts. And depending on the materials used, the heat output can range from low-temperature water for household use to high-temperature process heat for industrial applications such as aluminum smelting. The researchers are now building a prototype of their system. As the world looks for new ways to fulfill its appetite for energy, there are many technologies that can produce either heat or electricity using the energy of the sun. For example, in many parts of the world, people get warm water for their homes from systems in which sunshine heats up water inside a glass tube or black tank. Such systems are simple and inexpensive, but in that configuration they provide only warm water, no electricity. 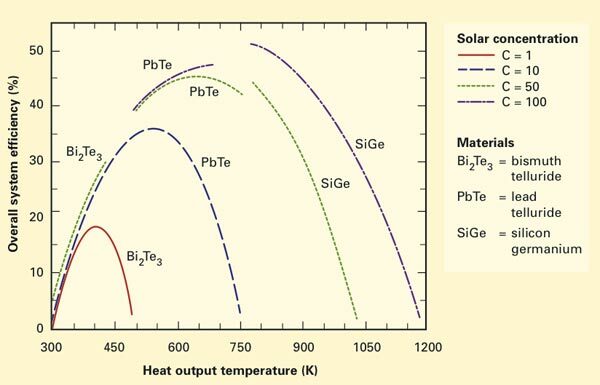 For electricity production, much interest is focusing on thermoelectric (TE) devices. When a TE device is hotter on one side than the other, it generates electricity—no combustion and no moving parts involved. But until recently, solar-driven electricity-generating systems using TE materials have not proved very efficient. 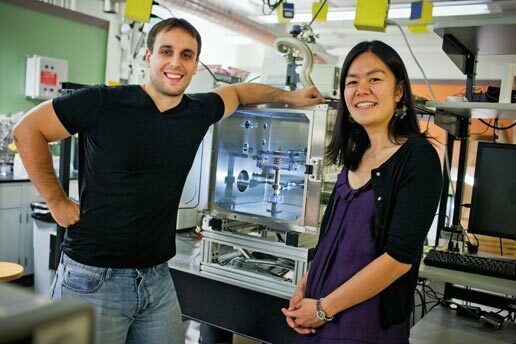 Now Evelyn Wang, associate professor of mechanical engineering and director of the MIT Device Research Laboratory, and Nenad Miljkovic, graduate student in mechanical engineering, have designed a novel hybrid system that brings those two approaches together to produce electricity and hot water or steam at the same time, pushing up both the temperature of the water and the efficiency of the overall system. In their version of the parabolic trough (shown above) Wang and Miljkovic use three concentric tubes. To maximize solar energy capture, they coat the outside surface of the middle tube with a selective absorber. Then, to keep the captured heat from escaping, they place that tube inside an outer glass tube, with a vacuum between them. The system thus absorbs as much sunlight and emits as little heat as possible. They then incorporate two technologies that increase efficiency and decrease cost and complexity. To get rid of the energy-consuming mechanical pump, they move the captured heat to the point of consumption using a “thermosyphon”—the central tube in the diagram. In this arrangement, the tube is only partially filled with a specially selected working fluid that evaporates when heated by the sun. The vapor that forms rises and flows naturally through the tube until it reaches a cool surface, where it condenses, releasing its heat. Because the system is designed with an upward tilt, gravity then forces the condensed fluid to flow back down to the area of the hot solar absorber, where it undergoes the heat-gathering, heat-releasing cycle again. The second technology they incorporate provides a simpler means of generating electricity than that used in a conventional parabolic-trough system. Instead of raising steam to run a generator, they use a TE material, strategically located to maintain the temperature difference that causes electricity to flow. As shown in the diagram, the TE material is incorporated in the form of “legs” that run between the absorber wall and the exterior surface of the thermosyphon, spaced at regular intervals with a vacuum in the gaps between them. In this configuration, heat from the absorber surface travels through the TE legs to the thermosyphon, where it is removed by the vaporization of the working fluid. As a result, each leg has one end attached to the hot absorber wall and the other attached to the constantly cooled exterior of the thermosyphon. The temperature difference is maintained, and current flows. TE devices are an attractive electricity-generating choice for several reasons. An obvious advantage is that they involve no moving parts, so they are simple, durable, and robust. Photovoltaic (PV) cells are likewise a solid-state system, and they are far more efficient at turning solar energy into electricity than TE materials are. But to work properly, PVs must be extremely pure and perfect, so making them involves carefully controlled and costly processes. In contrast, TEs actually work better when they are flawed; so even if rare materials are used, they can be fabricated using bulk manufacturing techniques. Moreover, using a specially formulated computer model, the researchers found that by carefully choosing their TE material, they could tailor their system to operate efficiently while delivering waste heat at a wide range of pre-specified temperatures. The figure above shows heat-output temperature at the end of the thermosyphon versus the overall efficiency of the system (heat and electricity combined). Solar concentration measures the degree to which the solar energy is concentrated by the parabolic trough. Concentrations of 50 to 100 are typical of today’s technology, and higher concentrations bring higher operating efficiencies. Using their model, the researchers identified a thermosyphon working fluid and tubing material that can operate in the same temperature range as each of the TE materials. For example, conventional water inside a copper tube works well with bismuth telluride. That system’s output heat is 300–500 K—appropriate for residential heating or for low-temperature industrial processes. Mercury contained inside a stainless steel tube combines with lead telluride to produce heat appropriate for low-temperature industrial processes such as chemical drying. And liquid potassium inside a nickel tube works with silicon germanium to generate high enough temperatures for processes such as aluminum smelting. In each case, rising temperature brings an increase in efficiency, but eventually radiant heat losses—which increase more dramatically with temperature than efficiency does—dominate and efficiency drops back down. The example of aluminum smelting demonstrates a major benefit of this new system. Generally, the extreme heat required for the aluminum smelting process is produced using electricity. “But this technology can help minimize electricity consumption. Instead of using electricity to generate the heat, our system can provide the heat by solar concentration from the sun during daylight hours,” says Miljkovic. “So you’ll use the heat to do the heating, and still have the electricity for other uses.” At the other extreme, a system designed for a single house could provide abundant heat along with enough electricity to meet the homeowner’s needs. The natural gas or oil now consumed for home heating could be used elsewhere for other applications. Guided by their simulations and a series of optimization studies, Wang and Miljkovic are now building a prototype to demonstrate how their hybrid system could work. Practical implementation of their approach may be several years away, but they are optimistic about the ultimate outcome, in part because of related research activities under way in Wang’s Device Research Laboratory. “All of our projects focus on efficiently transferring heat and mass in various types of systems,” Wang says. And what is unusual, notes Miljkovic, is that they incorporate surface science into their work. For example, one project looks at how to structure surfaces to make the phase change process itself—the vaporization and condensation—more efficient. “So within the design of our thermosyphon, we can actually introduce structuring of the surfaces to further enhance efficiency,” says Wang. By drawing on results from that and other projects, they will be able to continue improving the performance of their novel hybrid solar-thermoelectric system. N. Miljkovic and E.N. Wang. 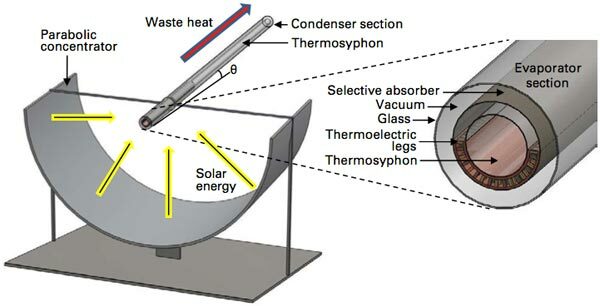 “Modeling and optimization of hybrid solar thermoelectric systems with thermosyphons.” Solar Energy, vol. 85, pp. 2843–2855, 2011.